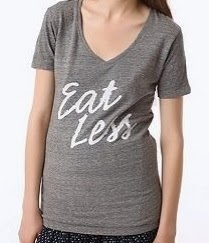 One Tree Hill star Sophia Bush took a stand and boycotted the store Urban Outfitters after they designed a t-shirt marked with the words "Eat Less". This shirt is disgusting! How could someone even think twice about designing a shirt like this? It's things like this that causes self-esteem problems, eating disorders, and many issues. This is so tasteless and promotes not being healthy in my opinion. Take a minute, let it sink in. For some people it can be hard to lose weight, but what about the people who have difficulty gaining weight? Is it less of a concern because we are skinny? What if we feel we are too skinny and want to gain weight, but it's hard to? I feel that many times when this topic is discussed it focuses on accepting beautiful curvy women, which I can see is a bigger issue in society- that's why it's discussed. But I personally wanted to discuss the other side of this topic- the skinny women. I am a size 0 and this struck a nerve with me the other day while at work when I had to do a try-on session for pants. It's just a bit harder for me to gain weight. Am I happy to be a size zero? Honestly, no. I would like to gain some weight, but I am not unhealthy. Yes, I am a bit underweight- but let me tell you something. I eat, snack- unhealthy food, healthy food. I eat. I do. But I am a size zero. I do support and applaud Sophia Bush [and all the others] for boycotting [and standing up to] a store that promoted shirts encouraging [young girls] to eat less, I do not support her in her stance that zero is not a size, because I am a zero- and at the end of the day I try to make peace with that and how I look. or the body image that every woman should strive for. But please do remember, at the end of the day you are not a number. You are a person. A beautiful one! Can I not be unhappy that I am a size zero? Do my body image concerns not matter because I am skinny? That's what I think, and this is how society and social media has made me feel. I am not picking a side. Just voicing my opinion. **I apologize if I offended or made anyone upset by what I have written.